Numerous surveys have revealed that people are more afraid of public speaking than they are of dying. There's even a technical name for this fear—glossophobia. Psychologists classify it as a social anxiety disorder although many who claim to hate public speaking may not be afraid of other social interactions. Learn as much as you can about your topic: When you are called upon to make a presentation, take the time to learn all about the subject matter. The more you know, the more comfortable you will feel sharing your knowledge with others. Find out who your audience will be: Are you going to be addressing people who are experts in your subject matter or will they be novices? It will be easier to prepare your presentation when you know the extent of your audience's knowledge. If you tell them things of which they are already aware, they will be bored, but if you leave out pertinent information, your audience will be lost. Prepare a presentation: While you may think ignoring an upcoming speech will keep anxiety at bay, not being prepared will only exacerbate your glossophobia. Your mind may go blank when you are up at the podium. Rather than attempting to give an off-the-cuff presentation, write down an outline of all the key points you want to hit, or even better, have your entire speech written out just in case your train of thought disappears. Speak extemporaneously if possible, but have a backup in case you need it. Don't memorize your speech: Don't attempt to commit your entire speech to memory. Things could spiral out of control if you suddenly forget a line. Instead, try to memorize your outline and the essence of what you want to say to the audience. Read your printed backup if you have to, but if you are well-prepared, you probably won't even need it. Practice: Rehearse your presentation. Many people find it helpful to do this in front of a friend or even a mirror. Some like to video record these practice sessions. Go over your speech several times in different ways—but again do not memorize every single word of it—to increase your comfort on the big day. Anticipate questions your audience may ask: Come up with a list of queries your audience might have. Start with the ones you had when the topic was new to you. Then prepare your answers. It is essential to realize that someone may throw what is known as a "real zinger"—a question you could never have anticipated or, much less, know the answer to. It's okay to say you aren't sure of the answer but promise to look into it. Don't forget to follow up. Dress well, but comfortably: Wear professional attire for your presentation. It should be an outfit that looks good and feels good as well. Knowing you look your best will help stave off glossophobia. Being comfortable will keep you from losing focus. A tight collar or shoes that pinch your feet can be very distracting. Stop telling everyone how nervous you are: Don't tell anyone except maybe one trusted person about your anxiety. Keep your complaints to a minimum if you decide to confide in someone. Dwelling on how nervous you feel will merely serve to exacerbate your nervousness. Instead, pretend to be confident. You may even start to believe it. Keep a glass of water nearby: A dry mouth while giving a speech happens to everyone, not only individuals who have glossophobia. Take sips of water occasionally to keep your mouth from feeling like it's filled with cotton. Find some friendly faces in the audience: Before beginning to speak, look for familiar faces, if there are any, in different parts of the room. Plan to make eye contact with those people during your presentation. If anxiety strikes, looking at these friendly faces should calm you down. Use visual aids: Create a slideshow using software like Powerpoint to make your presentation more interesting. Added benefit: it will give your audience something to focus on other than you. Be sure to check the facility to make sure it has the equipment you need and that you know how it works. For example, if you are planning a digital presentation, you will need a smart podium. Make other plans if the necessary equipment isn't available. Don't forget your slides should supplement your speech. Don't read directly from them. Speak slowly: People tend to talk more quickly when they are nervous so make a conscious effort to slow down. You will be less likely to stumble over your words when not rushing through your speech. 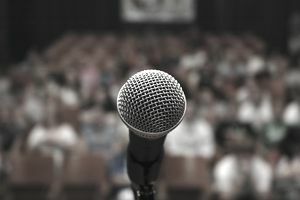 While it may not be possible to entirely overcome your glossophobia, following these tips will at least make public speaking easier. The more comfortable you are with it, the more often you will be willing to do it and that, over time, could be what finally makes your fear disappear.